I returned to my work on the handwritten notes on the 1918 Absent Voters' List for Barnsley yesterday and quite quickly got hung up on a few of men. There were two reasons for this; firstly I have not been well recently and my concentration wanders making serious research a bit tricky, and secondly the information in the AVL was incorrect or misleading in each case. This is the section of the AVL that I was working on. Blenheim Road is a long road that runs from Park Road near St Edward's Church all the way down to Pitt Street West, running parallel to Racecommon Road for most of the time. The houses at the Park Road end are larger than average, but lower down (which are the lower numbers) they are mostly terraced houses with walled yards at the front. Blenheim Avenue is a small street at the bottom end of Blenheim Road on which the houses are smaller with front doors directly onto the street. Both streets lie in St Edward's parish. I have been examining the men who were indicated in the AVL handwritten notes as Discharged, Missing or Prisoners of War - occasionally a man is listed as Dead or Killed, but there were none like that in this section. My theory is that a man who was discharged might have been wounded and may have subsequently died of his wounds before the Commonwealth War Graves Commission (CWGC) cut off date of 31 August 1921 in which case he should be included in our Roll of Honour of Barnsley's WW1 Fallen. A man who was noted as missing at the point the handwritten notes were added in the run up to the December 1918 election could very well have remained missing and thus was also a casualty. The Barnsley War Memorials Project's criteria for including a man on the Roll of Honour is that he should be either born in Barnsley, be living in Barnsley at the time of his enlistment or be remembered on a memorial in the Barnsley MBC area. Finally the prisoners of war are interesting in themselves, I have a separate Community on LFWW for them, but again, some of them may not have made it home, or may subsequently have died as a result of harsh treatment whilst a prisoner so may be candidates for the Barnsley Roll of Honour. Currently this Community has 54 men attached, but I know there are more than 200 listed in the Barnsley Chronicle in 1918, so I have many more to add. The first man I looked at was Bernard Hirst of 9 Blenheim Avenue, he was noted as Discharged. I found him with no difficulty in LFWW using the information given in the AVL and a search on FreeBMD showed that a man of this name and of an age to have served in WW1 (born 1892) died in Barnsley in 1970. I double checked the CWGC, but he was not listed. So not one for our Roll of Honour. The next man was John William Raven of 31, Blenheim Avenue who was marked as Missing. A nice unusual name, so I thought he would be equally easy to find. No! Nothing on either his name or the service number, 34065, given in the AVL. The abbreviation LNL was not one I'd come across before so I didn't know what to enter for regiment in the search on LFWW. If I can't find a man easily on Lives I turn to CWGC next. As Raven is fairly uncommon name I just used the criteria Surname: Raven and First World War in my search. I got 80 hits. I tried Raven and Initials: J and out of the eight results saw one which could, with one eye closed and an open mind, just about be a match. The service number had the right digits but in the wrong order, 34605 instead of 34065, and LNL could be Loyal North Lancashire. I clicked on the man's name to open the full entry and sighed in relief. In his additional information, a field which is blank far too often in my experience, it stated, "Husband of Annie E. Raven, of 31, Blenheim Avenue, Bamsley." Well, this is the right man after all! However he was marked as Missing in the AVL and this entry says he died in March 1918. Oh, dear, there is probably a story there. As he is remembered on the Arras Memorial he has no known grave. I wonder when his family were told he was presumed dead? 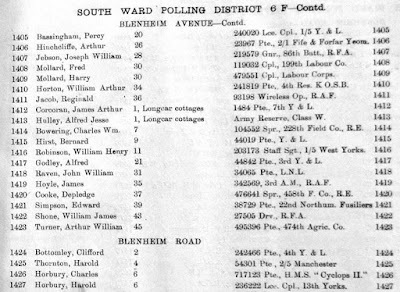 With the correct service number I was soon able to find John Fleming Raven on LFWW and add him to my Barnsley War Memorials Project (BWMP) and Absent Voters' List Communities. I hadn't heard his name before, and despite his home being in St Edward's parish he does not appear on St Edward's War Memorial, so I did a search on the BWMP site to see if we had recorded his name elsewhere. He is remembered on panel 5 of the large gothic pink memorial in St Mary's church in the centre of Barnsley. I have added him to that Community on LFWW as well. I don't know why he is listed in the AVL as John William Raven instead of John Fleming Raven, the service number mistake is probably just a typo, but you would have thought his family would have given his name correctly to the Electorial Register people? The next man whose handwritten note suggested I should do more investigation was Harold Thornton of 4, Blenheim Road. He was noted as being a Prisoner of War. As I had a web page for the BWMP open I did a search for his name first. 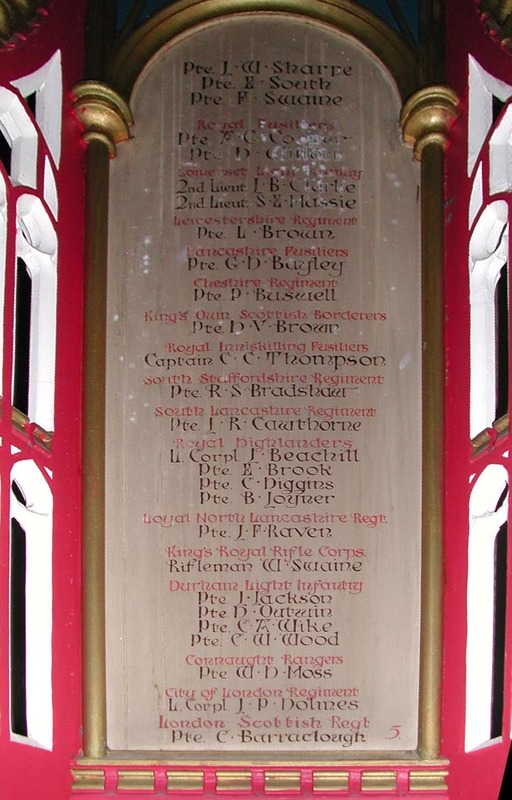 The only hit I found was on the Memorial Panels in St Helen's Church in Hemsworth, which I thought unlikely given that he or his family were living in the centre of Barnsley in 1917/18 when the names for the AVL were collected. Of course if he returned safely from his time as a prisoner he would not be on any memorial ... so I re-started my research process in the correct order by looking for him on LFWW and the CWGC. I got a hit straight away for Thornton and service number 54301 on LFWW. The man's forename was Harold and he was in the Manchester Regiment, this must be my man. As I clicked the button to 'Remember' him I noticed that there was a date of death already entered against him, 27 April 1918, which means that LFWW had already linked him to an entry on the CWGC as part of their automatic process. This also means that by the time the handwritten notes were added to the AVL in Barnsley Harold was not a prisoner of war, he was already dead. Moving onto the CWGC via the link on LFWW I saw that the additional information stated that he was "Son of George Edgar and Ellen Thornton, husband of Ethel Thornton. Born at Dewsbury, Yorks." Of course even if he was born in Dewsbury he and his family could quite easily have moved to Barnsley between his birth in 1888 (calculated from his age, 30, at death) and the collection of the AVL data in 1917/18. So next I looked for a Harold Thornton, born 1888 in Dewsbury, living in Barnsley in 1911. The only hit for that name, age and birth place was in Hemsworth! What a coincidence, given that I'd found a called Harold Thornton on the Hemsworth war memorial. The young man I had found was 23 years old, a boarder with an older couple called Twiley, and a Boot Manager, whatever that was. Could this be the right man? 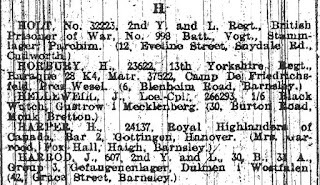 As a wife was mentioned on the CWGC I tried looking for a marriage for Harold Thornton to a lady named Ethel on FreeBMD and found a hit in Barnsley in 1915. This was more like it! A search on Ancestry's West Yorkshire Parish records collection soon found his marriage to Ethel Illsley in Darton (see above). It is the right man as he names his father as George Edgar Thornton, which agrees with the CWGC additional information and his occupation as Boot Manager tallies with the 1911 census entry I had found. Both bride and groom give their home addresses as places in Hemsworth. Ah, ha. Things are joining up at last! An Ethel Illsley was born in Barnsley in 1892 and her parents had married at St George's in Barnsley in 1891. Illsley (which can be mis-spelt so many ways!) is a rare name in Barnsley. Ethel's father, John Illsley, was from Staffordshire originally. 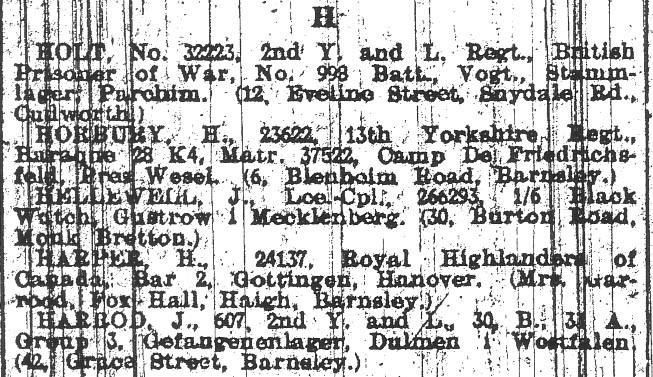 So maybe Ethel had returned to live with or near a member of her family in Barnsley while Harold was serving in the army, and the address given in Hemsworth when she married him was where she had been working/living in as a Tailoress? The witnesses at the marriage, Robert and Annie Elizabeth Illsley are brother and sister to Ethel, according to the family's entry in the 1911 census. You might have spotted that Harold says he's a widower at his marriage to Ethel. So between the census of 1911 where he is a single man and his marriage in 1915 he has married and lost another wife. 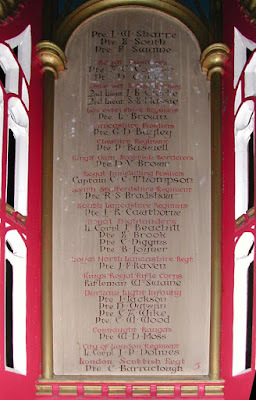 A few searches on FreeBMD and Ancestry later I worked out that he'd married Elizabeth A Knox in Newcastle upon Tyne in 1911, the banns being read in St Helen's, Hemsworth beforehand. They had one child, Olive E, born in Q2 1914 in the Hemsworth Registration District and Elizabeth A Thornton aged 27 died in Hemsworth in the same quarter. The burial records for Hemsworth are available to browse (they are not indexed by name) on Wakefield Council's website. Elizabeth Thornton's address at her death on 2 May 1914 was 71 Kirkby Road, Hemsworth, which very nearly matches the address given by Harold at his marriage to Ethel the following year. So Harold was left with a small daughter to care for after the death of his wife, that would give him a reason to marry again fairly quickly. Harold and Ethel themselves had a son, John J E V Thornton, born in Hemsworth in 1916 by which time I expect Harold had joined the army as conscription, even for married men, came in in 1916. Unfortunately a John E V Thornton dies in Barnsley aged 0 in 1917. John Edgar Vincent Thornton aged 6 months is buried in Barnsley Cemetery in a plot shared with two Illsley children. This is more evidence for Ethel's move to Barnsley during Harold's service. This search on Thornton deaths also highlighted an Olive Thornton who died in Barnsley in 1929 aged 14. This is probably Harold's daughter by Elizabeth, such a shame that neither of Harold's children lived to adulthood. And his widow? 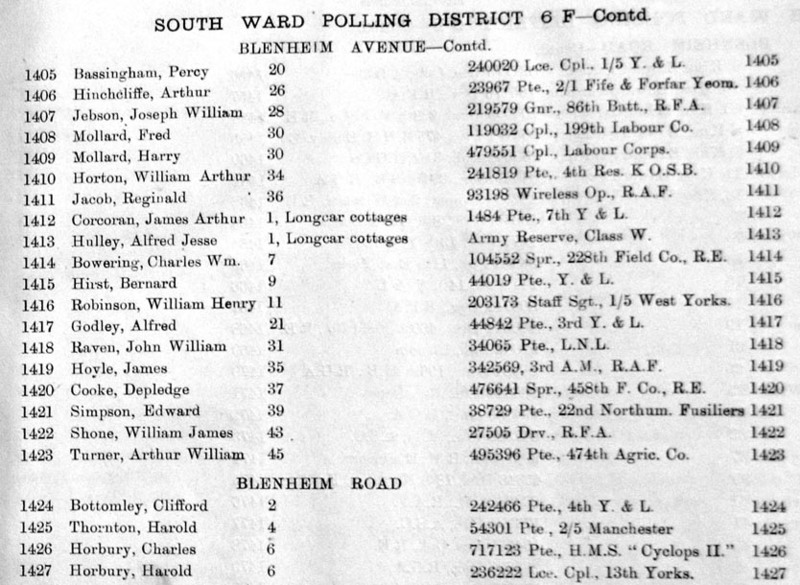 In the 1930 Electoral Roll the occupants of 4 Blenheim Road are a John William and Ethel Elliott, so I looked for the marriage of Thornton to Elliott in FreeBMD, which you can see that I found in Q3 of 1919. They have a child named Iris in 1920 whom I found on FreeBMD by searching for births to Elliott, mother's maiden name Illsley, confirming that this is the remarriage of Harold's widow. So Ethel knew that Harold wasn't coming home by the middle of 1919 and that she was free to marry again. His CWGC record shows his burial details at Valenciennes Communal Cemetery in France after his death in April 1918, so why didn't the family or the Electorial Register people know that he was dead at the time the handwritten notes were added to the AVL? The CWGC added some fascinating additional documents to their index last year. You can now see lists of burial information and records of the concentration of burials after the war. The above snip shows that Pte H Thornton of the Manchesters was buried in the German Extension of the cemetery at Valenciennes. His body was exhumed and reburied in 1922 after being positively identified by a plate on his coffin. Presumably he died after being taken prisoner in the great German push of early 1918 but only the fact that he had been taken prisoner had reached his family by the autumn of 1918. I wonder why he is remembered on the Hemsworth Memorial and not on one in Barnsley, but I suppose any of his family or friends might have asked for him to be included at St Helen's as he lived there for a while and his first wife is buried there. Having sorted out that Harold Thornton does NOT qualify for inclusion on the Barnsley Roll of Honour after all that - he was born in Dewsbury, probably lived in Hemsworth when he enlisted at Pontefract and is remembered on a memorial outside the Barnsley MBC boundary - I moved onto the next man on my list. Harold Horbury, of 6 Blenheim Road, was marked up as, "Prisoner of War, E Camp" in the AVL handwritten notes. His details were Service number 236222 of the 13th Yorks regiment, and I could not find him on LFWW. Oh, dear, here we go again! Happily I found him in my transcription of the list of POWs from the Barnsley Chronicle in August 1918. Incidently Harold Thornton is not on this list, maybe because his home address was actually Hemsworth or maybe because he did not appear on the list the Chronicle was working to, as he was already dead. The AVL appears to have got Harold Horbury's service number wrong, they have been a bit overenthusiastic with the 2s! However searching for Horbury and 23622 on LFWW still didn't bring back anyone, so I tried just the number and found a Harold Horburn who looked like the right man. Maybe a transcription error from his Medal Card had changed him from Horbury to Horburn? The images of the Medal Cards are available on Ancestry. LFWW work from the transcriptions provided by The National Archives (TNA) which are sometimes inaccurate and I often have to attach a link to the medal card image to LFWW as External Evidence to show the correct details. But not in this case, despite his Service Records, which are luckily part of the 40% of which survived the blitz in WW2, quite plainly stating that his name is Horbury, his medal card and medal rolls all say Horburn. Harold enlisted in September 1915 aged 19 years and 25 days. He is not married and his next of kin is Charlotte Horbury, of 6 Blenheim Road, his mother. He was reported missing in July 1917 and after his mother forwarded a post card from him to the War Office in September 1917 he was subsequently listed as a prisoner of war. He was repatriated back to England in November 1918. He has no CWGC entry and I cannot see a death for him in the Barnsley area. This man is NOT a candidate for the Barnsley Roll of Honour. So, as you see, what started off as a fairly straightforward tick list activity got quite complicated when the data in the AVL did not tally with that on other sources I have been using. I did identify one man, John Fleming Raven, who was listed as Missing on the AVL as a man who is already on one of Barnsley's war memorials, but the others I looked at either did not die during or from the effects of the war, or in the case of Harold Thornton, were from outside our area so cannot be included in our Roll of Honour.